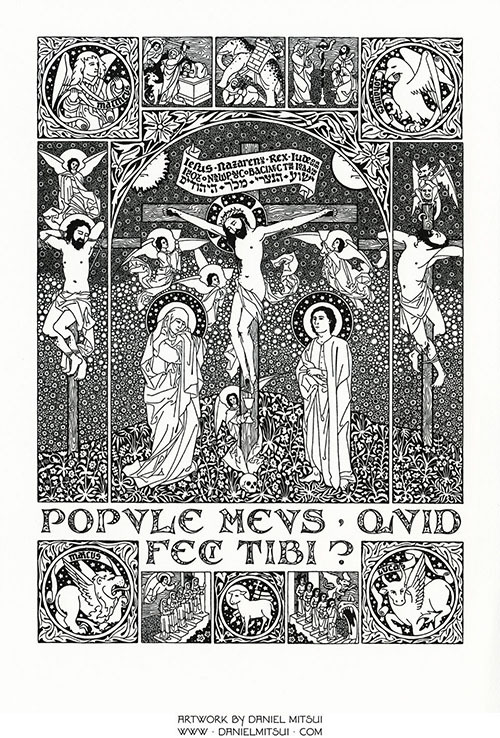 The central image depicts Jesus Christ on the Cross, with the Blessed Virgin and St. John. In medieval art, a Crucifixion scene is almost always divided into two sides. The one to Christ’s right hand represents the New Covenant and includes the Blessed Virgin, the sun, and the good thief Dismas; the one to His left hand represents the Old Covenant and includes St. John (who, when allowing St. Peter to pass before him to enter the empty Holy Sepulcher, became a type of the Old Covenant), the moon and the bad thief Gesmas. A skull at the foot of the cross indicates Calvary, the place of the skull where Adam was buried. A millefleur pattern fills the rest of the ground beneath the three crosses. The inscription above the cross is written in Latin, Greek and Hebrew, as described in the Gospels of Luke and John. Four angels hold chalices to catch the Precious Blood. At the top of the print are three prefigurements of Christ’s death, taken from the Biblia Pauperum and the Speculum Humane Salvationis: Abraham’s sacrifice of Isaac, Eleazar Maccabee killing a war elephant and dying underneath the falling beast; and Moses lifting up the brazen serpent in the desert. The allegorical significance of the brazen serpent was explained by Christ Himself: And as Moses lifted up the serpent in the desert, so must the Son of Man be lifted up: that whosoever believeth in him, may not perish; but may have life everlasting. At the bottom of the print is the Lamb of God, flanked by the parabolic Wise and Foolish Virgins. In the corners are the four winged beasts representing the Evangelists. The text is from the reproaches that are sung during the Good Friday litury. It is set in Victor, a typeface that I designed myself. The letters have the basic shapes of capitals that appear in medieval manuscripts, paintings and tapestries. Their outlines are filled with tiny decorations: plants, fungi, beasts, birds, bugs and fish. 15th century panel paintings, tapestries and prints influenced the drawings upon which this work is based. Artists whose work I studied include Gerard David, Martin Schongauer, Rogier van der Weyden and the Master of the Holy Kinship. Dimensions: 10" × 14 1/4"
The print costs $53. You may use the button below to pay via PayPal, debit card or credit card. Be sure to confirm the shipping address. See this page for additional ordering instructions and general information. If you want to pay via a check or money order, please e-mail me at danielmitsuiartist at gmail dot com. I can color this print by hand, using pigment-based calligraphers’ inks applied with brushes. I use 23k gold leaf and/or palladium leaf for the illuminated details. Please note that the brilliance of the leaf does not show well in the scanned image. Each hand-colored print is unique. The one you receive will not be identical to the one shown here. 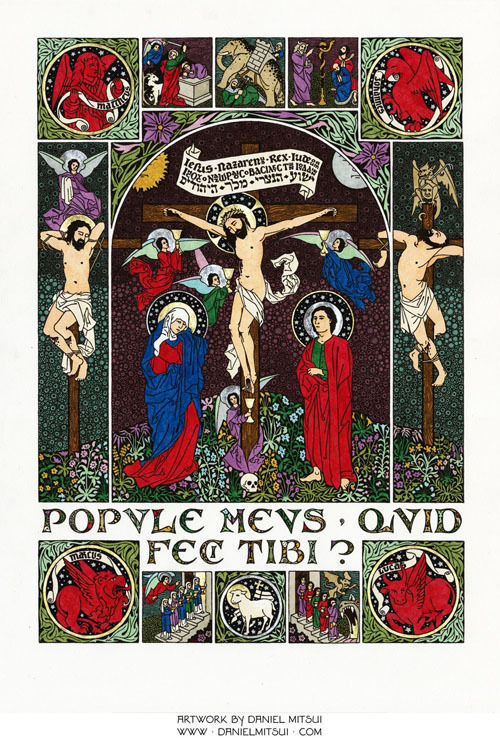 The hand-colored print with illuminated details costs $1093. You may use the button below to pay via PayPal, debit card or credit card. Be sure to confirm the shipping address. See this page for additional ordering instructions and general information. If you want to pay via a check or money order, please e-mail me at danielmitsuiartist at gmail dot com.